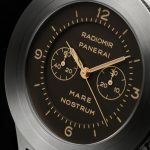 It has been a long time coming and a day that many Panerai fans believed they would not ever see again. I am here to tell you that some of your wishes have come true with the re-emergence of the Mare Nostrum model at this years SIHH show. Mare Nostrum, meaning “Our Sea”, in reference to the Mediterranean, was named by the Ancient Romans after their conquest of Egypt and Spain. Fast forward to the early 40’s and once again this sea was to become known as Mare Nostrum by the Italians during the Second World War. 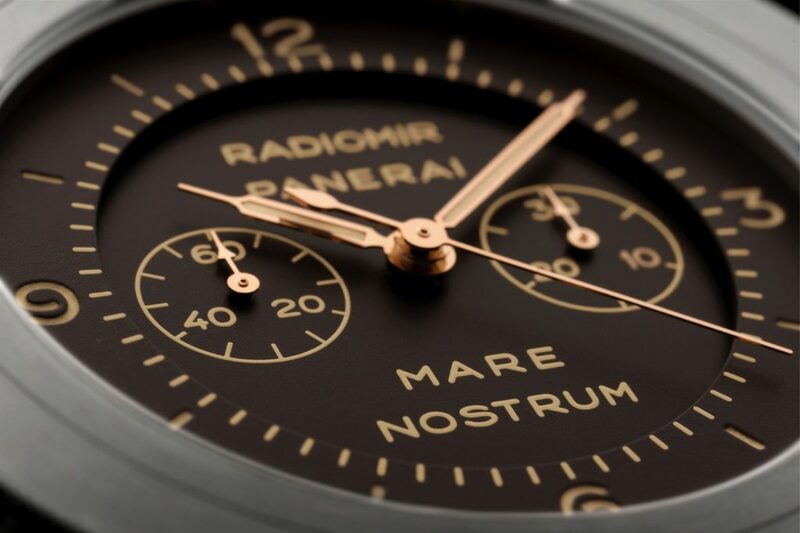 It was around this very time in 1943 that the Panerai family name the chronograph created for the deck officers of the Royal Italian Navy “Mare Nostrum”. The first traces of this particular piece date all the way back to 1924 to what is believed to be Panerai’s first chronograph. Unfortunately all traces of this first model have been lost. Fortunately a few prototypes of this newer chronograph from 1943 still exist, enabling a new watch to be constructed with amazing technical accuracy and similar aesthetics. 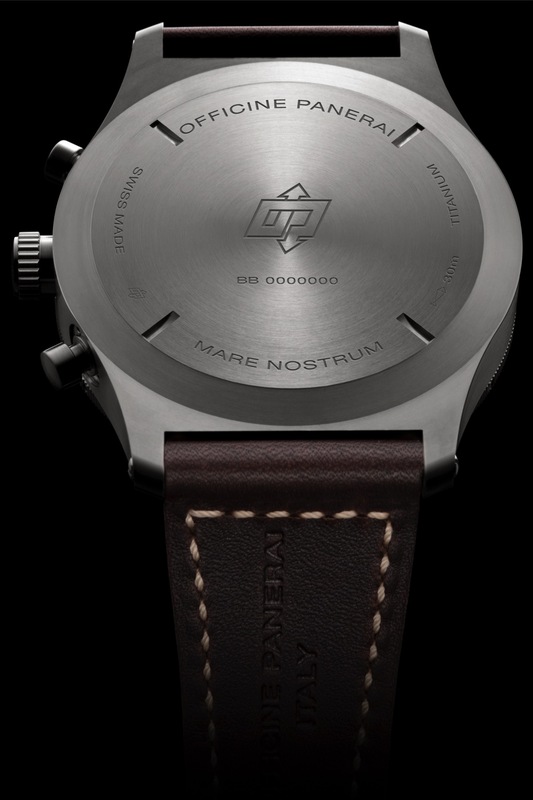 Flash forward to 2015 and the new Mare Nostrum Titanio (Titanium) is a special edition limited to only 150 units and is gorgeous reproduction of the 1943 prototype. 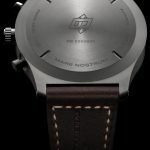 While it looks very much like it’s prototype, with the exception of a few fundamental differences from it’s predecessor, the new version has been greatly upgraded to today’s high quality watch making standards. The first difference you will notice compared to the vintage model is that the case is now 52mm in diameter and made out of brushed titanium. 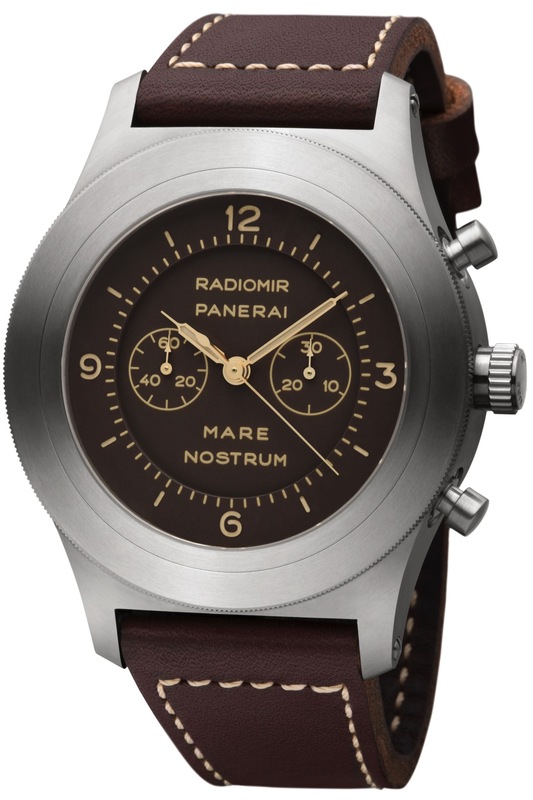 This metal combines great structural strength while keeping the watch very light despite the larger diameter size. 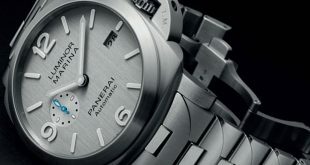 The use of this brushed titanium can be seen not only the case but also on the flat bezel and winding crown. 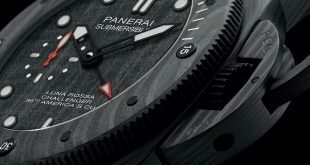 The dial, which is protected by a sapphire crystal, treated with and anti-reflective coating is made of two levels. Instead of the dark green we commonly see in the vintage version, this model uses a tobacco brown dial that is complimented nicely by the brown leather strap. I am sure that purists would love to have it look exactly like the vintage model but personally I like the tobacco dial as it lends itself to more strap and outfit options. 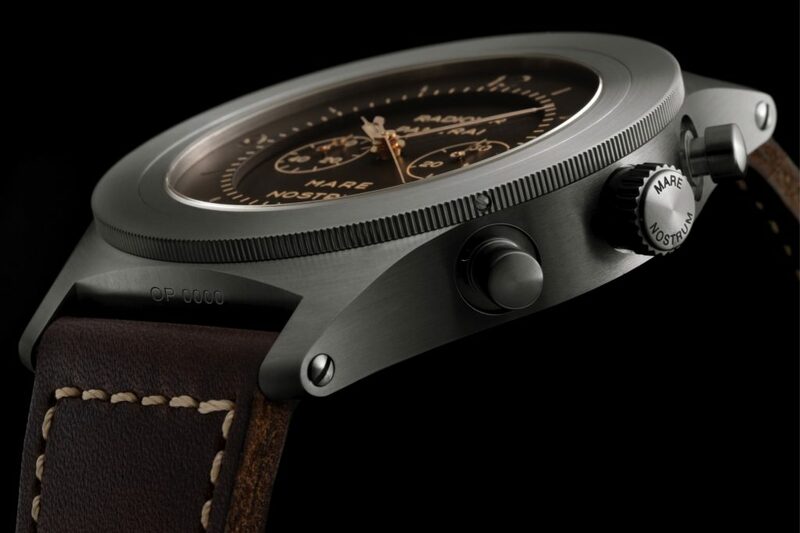 The Chronograph on the PAM603 is controlled by two classic push buttons also made of brushed titanium. The readings of the chronograph on the dial feature a central seconds hand and a sub dial minutes counter at the three o’clock position. 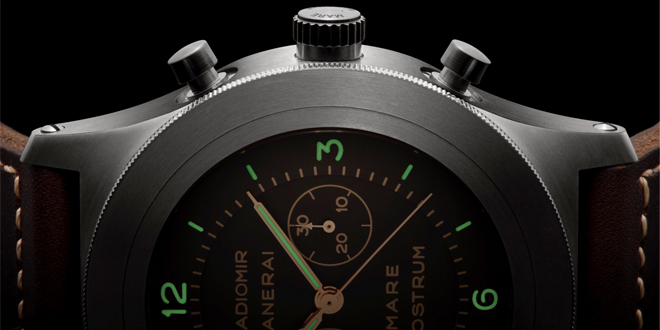 The heart of the chronograph movement on the PAM603 Mare Nostrum is a hand wound manufacture movement: the OP XXV caliber developed on a Minerva 12-22 base. The movement is 12 ¾ lignes in diameter and has a balance wheel that makes 18,000 vibrations per hour, exactly like the Angelus movement that was present in the vintage model. This amazing movement features bridges that are made of Maillechort, a nickel silver allow that is particularly hard to work and have a sophisticated Cotes De Geneve finish. 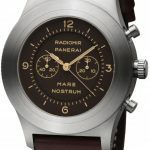 Being that the PAM603 is so close to it’s vintage counter part and such a limited production piece, I personally think that it will be one of the hits coming out of SIHH2015. Most fans of the brand might look to a Luminor as their first purchase, but when it comes down to it, a true purist and fan of the brand can not help themselves to jump on the list. 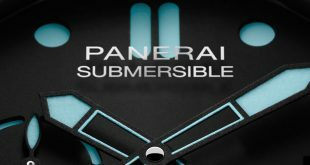 As a loyal and collector of the brand I am always looking for a model that will tie back to the pure Panerai DNA. With such a rich history you can’t help but want to imagine yourself as part of the Royal Navy receiving a Mare Nostrum. 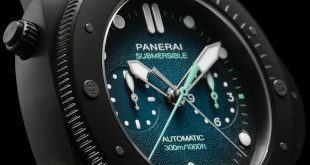 We saw the same effect when a regular production model like the PAM372 was released. 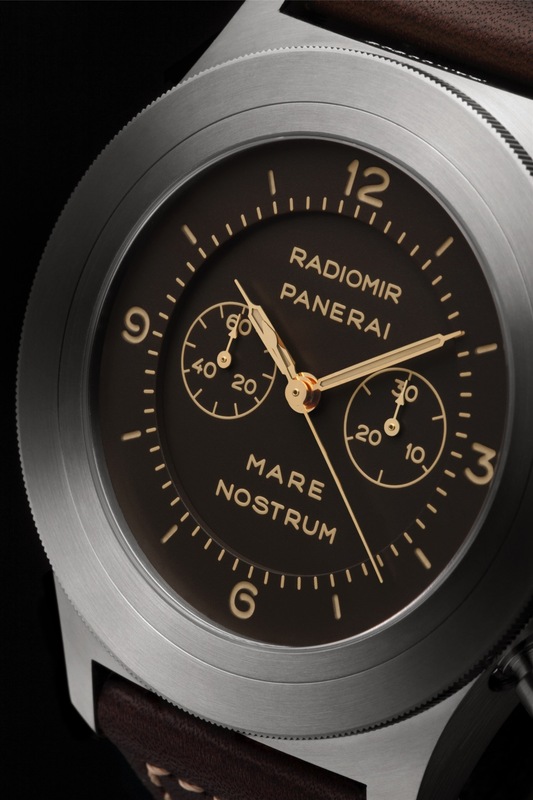 It was met with such fan fare and joy because it really brought back the true Panerai Vintage DNA. You might want to give your local boutique a call because the list is going to fill up fast when this model is finally released.